In 1199, Richard was in the Limousin suppressing a revolt by Viscount Aimar V of Limoges and besieging the puny virtually unarmed castle of Châlus-Chabrol. It is claimed that he only did this because of a treasure trove of Roman gold which had been unearthed by a local peasant which Richard claimed from Aimar in his position as feudal overlord. In the early evening of 25 March 1199, Richard was walking around the castle perimeter without wearing his defensive chainmail, when he was struck in the left shoulder near the neck by a crossbow bolt. He tried to pull this out but failed. A surgeon then removed it but apparently without due care making the wound much worse in the process. Not long after, the wound became gangrenous. Accordingly, Richard asked to have the crossbowman - one of his own men brought before him. The man turned out according to some sources to be a boy. The boy claimed that Richard had killed his father and two brothers, and that he had tried to kill Richard in revenge. Richard, as a last act of mercy, forgave the boy saying: "Live on, and by my bounty behold the light of day," before ordering the boy to be freed and sent away with 100 shillings. Richard then set set about putting his affairs in order, bequeathing all his territory to his brother John and his jewels to his nephew Otto. 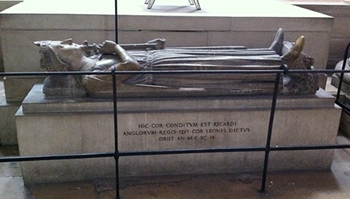 Richard the Lionheart died on 6 April 1199 in the arms of his mother Eleanor of Aquitaine. Richard's last act of chivalry proved pointless as a certain infamous mercenary captain Mercadier is said to have had the crossbowman flayed alive and hanged as soon as Richard died. 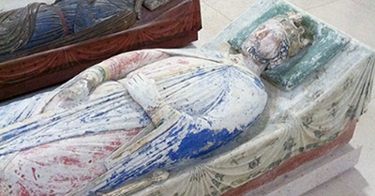 Richard's heart was buried at Rouen Cathedral in Normandy, his entrails in Châlus where he died and the rest of his body was buried at the feet of his father Henry II at Fontevraud Abbey in Anjou. 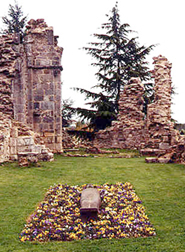 He was later to be joined by his mother Eleanor of Aquitaine at the same Abbey.